Happy Monday!! We had a nice break from the 114 degree Saturday when we FINALLY got some rain! What a blessing that was! Anyway, Monday means it's time to reveal our crazyjoy challenge photos for historic. 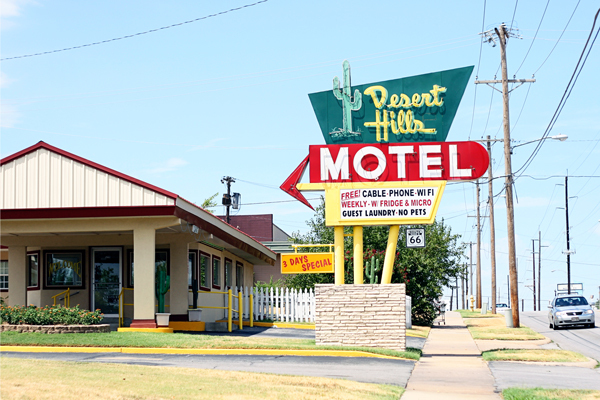 Living in Tulsa, I daily see signs for "Historic Route 66". I wanted to take a picture of something on Route 66 and found the perfect thing. It's an old motel, the Dessert Hills that was built in 1953. I love the neon sign and the fact that you can see the Route 66 sign too! Head over to Anna's blog today to see take on HISTORIC and to link up your own photo! You know, I´d love to go on a trip with my "crazy-about-cars" little boy, on route 66. What do you think? Is it a trip a 7 years old (Cars´ fanatic) would like?? ?